Call them what you want - in-ears, in-ear-monitors or inter aurals - these tiny earbuds are among the most common gadgets around. The most obvious upgrade for anyone with a smartphone whose bundled in-ears are about as dynamic as George Osborne, a good pair of earbuds can take tunes to a higher level for relatively low spend. We've included models from across the range of current selling prices, of course, though there are obvious differences. Pricier pairs generally offer more detail, range and bass, and better noise isolation (handy on trains and possibly even planes), though even £50 / US$60 / AU$70 buys a pretty high-end experience. Almost all now include an in-line remote for tweaking volume, changing tracks and hands-free calling, though most are primed for iOS devices. The remote button sometimes works with Android phones, but the volume keys don't. Almost all models come with a choice of tips, where which one you choose is crucial for sound quality, noise isolation and comfort, so don't be afraid to ditch those default tips. Tangled earphones are the bane of every commuter's morning, and it's doubtful many of us even get to the bus stop with cables in-situ. Swedish design takes a stab at this ungodly problem with the completely flat cables of the a-JAYS One+, which are also a great value attempt at bringing hands-free options to the wider smartphone community. Connecting to any brand of phone using a neat L-shaped 3.5mm jack, it's a cinch to operate volume and answer calls, while music is handled well above its price-point, sounding bass-heavy, detailed and well-rounded. Noise isolation is decent, too. Wound up in a pocket, the a-JAYS One+ spring back to shape and are indeed much easier to manoeuvre, though the downside is that they feel a little heavier when being worn - probably because there's a hint of friction between the silicon cable and clothes. Comfy in the ear, there are five pairs of tips to choose from on this versatile choice that should last longer than most. The SoundMagic E10Ms are all about isolation and one of the most balanced soundscapes available for this price. With plenty of detail within a rich, nuanced and powerfully bass-heavy sound, the E10Ms' tips create an excellent seal against outside noise, though the use of metallic drivers can make them feel cold when donned first thing in the morning. Elsewhere it's a relatively generous package, with no less than six choices of tips as well as a posh drawstring bag for storage. Add a useful splitter and an in-line remote that, again, works only for iPhones, and the SoundMagic E10Ms are among the best performing in-earphones at this low price. It might have a shrunken 3.5mm connector and a super-slim cable, but the Sennheiser MM 30i produces a sound much bigger than we'd expected at this price. It's primarily low-frequency prowess that makes these a standout option for the money, though the in-line remote is another factor. It works well, though its volume toggle and call answering button only work with iPhones and iPads. Three pairs of tips are supplied in the box, and though even the middle-sized pair take the MM 30is deep into the ear, the flip-side is excellent noise isolation that works well on city streets. Easy to travel with, our only bugbear about these super Sennheisers is that they get tangled rather too easily. Use a pair of in-ears every day and they soon begin to show signs of wear. Which is why Klipsch came up with the S5i Rugged, a well built pair of in-ears that might sound a tad outdoorsy, but in reality behave very well on the daily commute. 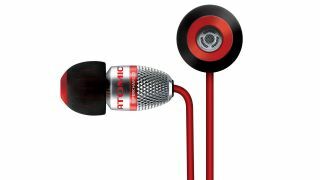 Firstly, they're rain-proof, while sound quality is excellent and well primed for both podcasts and music.